In this article, I introduce a series of tasks to use Blender, create a simple model and upload it to STYLY for those who have no experience with modelling. It’s about how to attach textures. 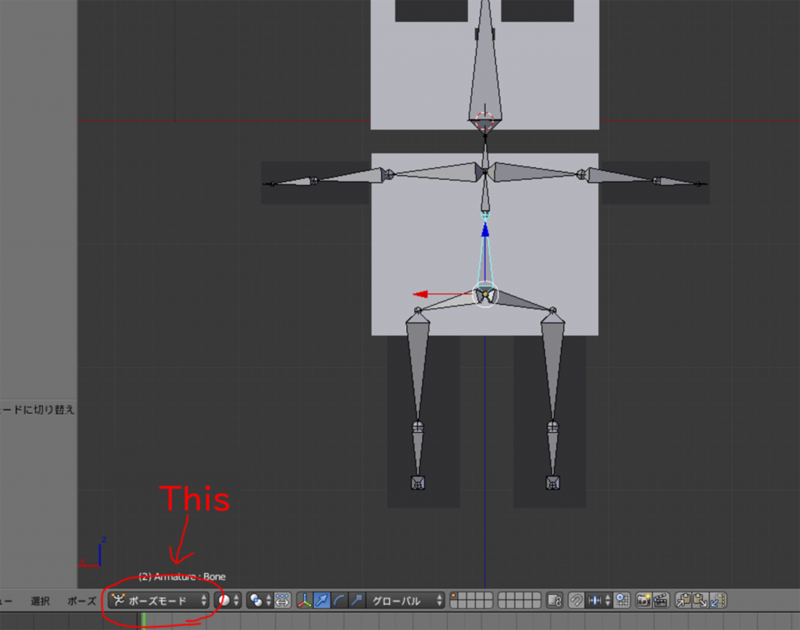 This time, I explain how to set bones for the model. 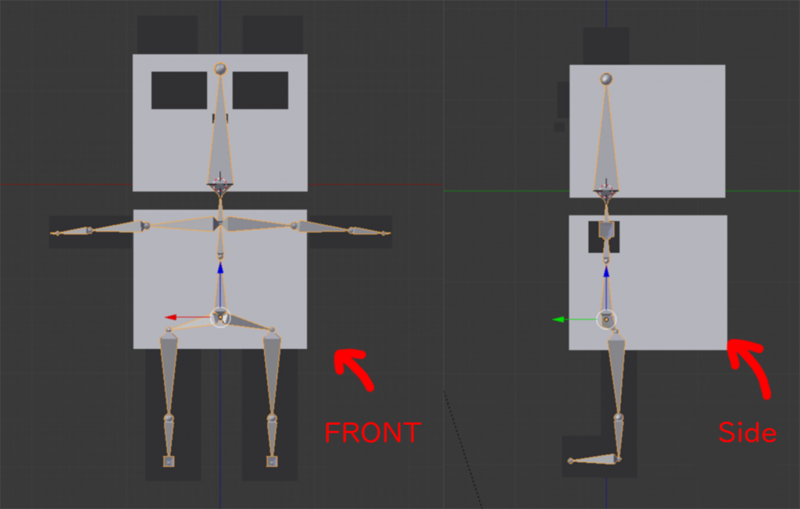 In this article, I explain the way to set bones manually. Prepare the 3D model with ‘T-pose’. If each part is defined as a separate object, select all the objects and group them by ‘Ctrl+J‘. All the parts such as hair, body, have been grouped. 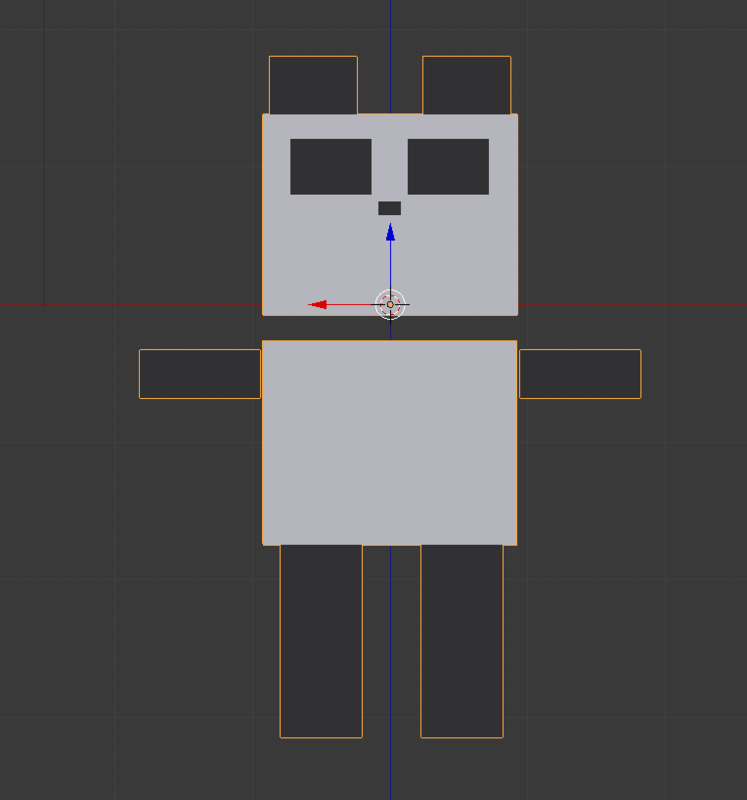 This is a ‘stylish version’ of the panda created in the first article. lol. If there is no Numpad, you can switch the view by selecting the commands under ‘View’ on the bottom menu. Then we start setting up bones. 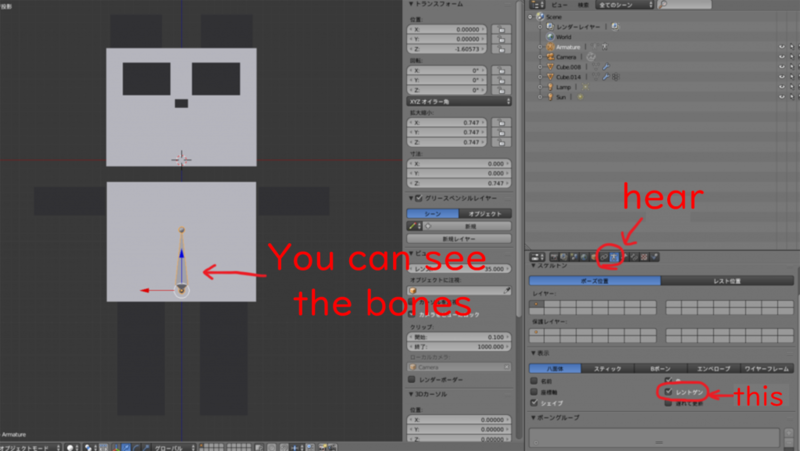 In Blender, bone is called Armature. 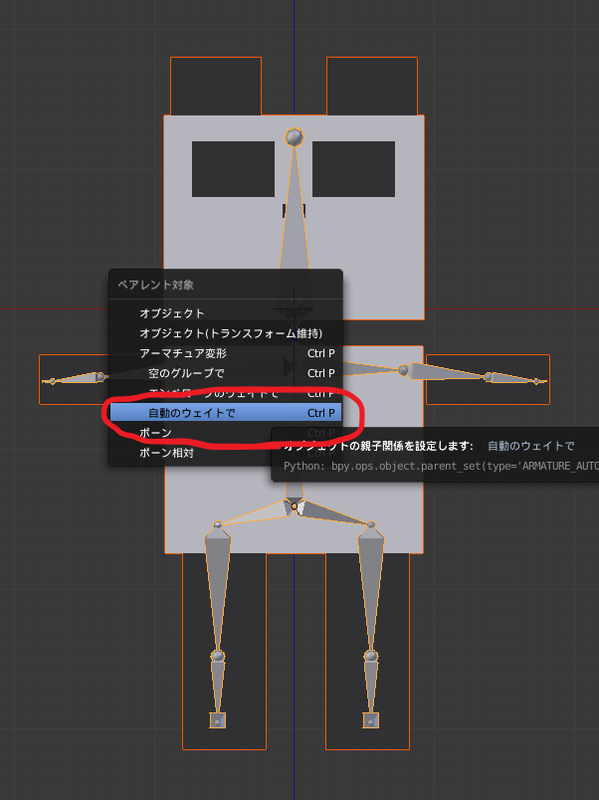 The bone will be created at the position of the 3D cursor (the one looks a red and white inflatable ring), so move it back to the origin by pressing ‘Shift+S’ and selecting ‘Cursor to Center’, if it’s moved somewhere else. Likewise, move the model to be associated with the bones to the centre by selecting ‘Selection to Cursor’. 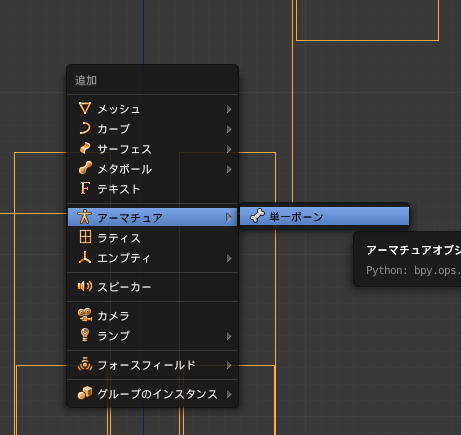 In the Object mode, press the ‘Z’ key to go to the wireframe view. Then press ‘Shift+A’ and select ‘Armature > Single Bone’. It creates a single bone. A single bone has been created. You can move and scale this bone in the same way as an object. We use this first bone as the spine, so move it around the waist and adjust it to an appropriate size. 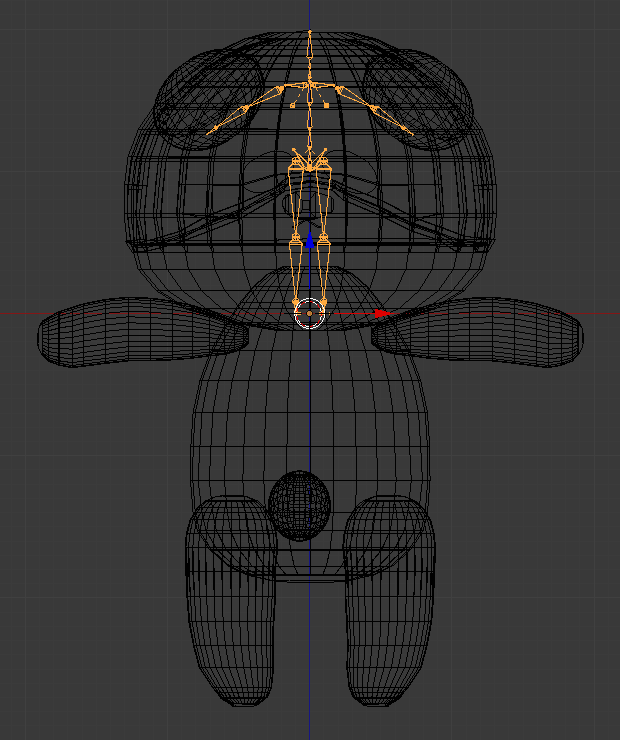 Roughly speaking, I recommend making one or two bones to construct the spine when creating a simplified character with about three-head-figure size or an animal-like character. We use two bones this time, so adjust each bone to about half of the height of the upper body. Then we set up the bone. 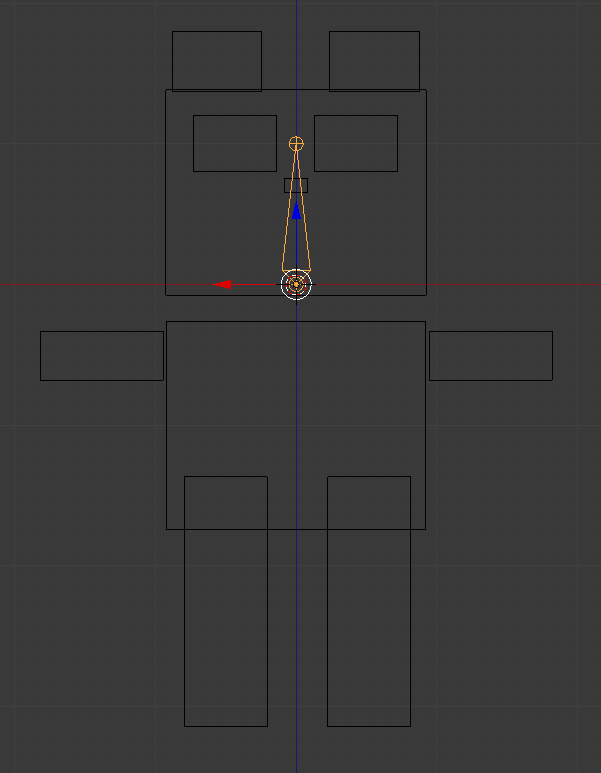 By going to the Edit mode, you can make the joints at the extremities of the bone selectable. At first, select the top joint and press the ‘E’ key to extrude. Then, a new bone will appear. By pressing the X, Y or Z key immediately after pressing the ‘E’ key, you can make the new bone in the exact direction you want. Repeat this sequence to add more bones. However, if you make the bones of the arms, legs and etc. 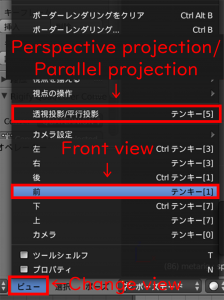 symmetrically, check the ‘X-Axis Mirror’ box on the ‘Option’ tab of the left menu in the Edit mode. Then press ‘Shift+E’ to extrude. Following the instruction above, set up the bones as shown below. For the legs, please refer to the side view. Once the setup has been completed, select the mesh and the bones in order, press ‘Ctrl+P’ and select ‘With Automatic Weights’. Now the bones have been assigned to the mesh. Let’s check if they have been assigned correctly. 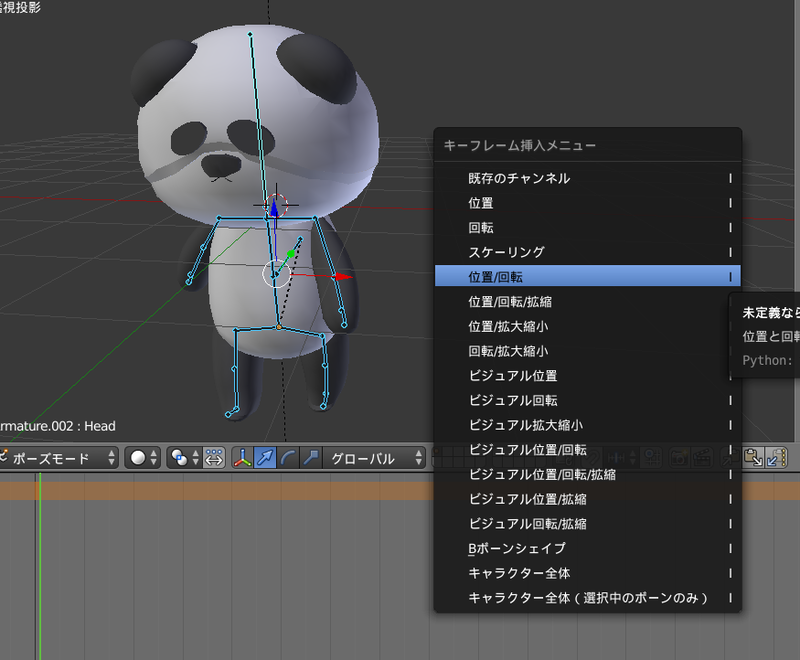 In Pose Mode, you can set a pose by rotating a bone and etc. You can also go to this mode from the menu at the bottom. Select the bone you want to move and rotate it by pressing the ‘R’ key. …The arm looks cute, doesn’t it? Try rotating all the bones. It’s completed if you saw the model follows the movement of every bone. However, in most cases, something goes wrong. Look at the GIF animation below. Panda’s lovely nose doesn’t move! The nose stays still because the nose has not been associated with the corresponding bone correctly. The function to adjust it is ‘Weight Paint’. Select the mesh and press ‘Ctrl+Tab’. It’s painted in ‘hot’ colour if it’s associated with the bone strongly while it’s painted by ‘cold’ colour if it’s weakly associated. You can see the nose is painted in blue. It is the cause. In this ‘Weight Paint’ mode, you can paint the mesh. In this case, it seems to be good to paint the nose, which is blue currently, in red. 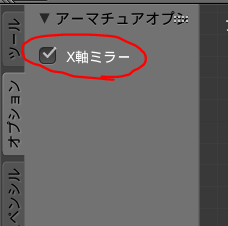 You can change the setting for painting in the left menu. The weight can be adjusted by the value of ‘Weight‘. Set the weight to 1 and paint the nose. The nose now follows the bone! You should see the nose moves as shown below. When you use the model with a large head, automatic paint could associate the head with the bone of the arms. So, how correctly it’s painted depends on the shape of the model. In the next article, we will create an animation from here. In addition, please refer to the article below, which is in my private site. 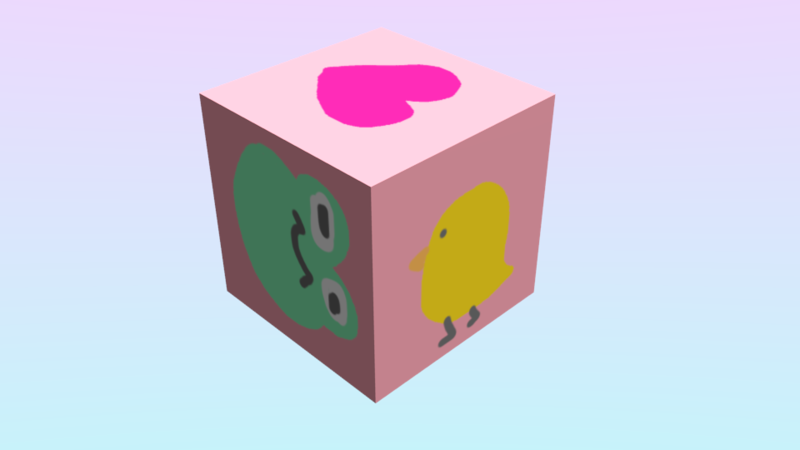 ・X-Ray: The visual mode to make bones visible even in the Solid display mode. ・Shift+E: In this tutorial, it’s used to extrude bones symmetrically when the ‘X-Axis Mirror’ is checked.